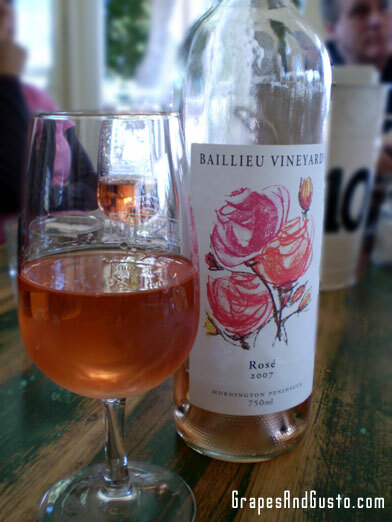 Australia's Baillieu Vineyards Rose is both pretty and versatile, though may be hard to come by stateside. If Barbie dolls drank wine, they might pick this stylish label to match their sun dresses (Summer Sipping Barbie, anyone?). But as for the contents inside the bottle, au contraire, mon frere. Festive, airy, and refreshing, Baillieu Vineyard’s 2007 Rosé is made from the Pinot Noir and Pinot Meunier grapes (of Champagne-region fame), gently pressed into a crisp, fragrant sensation. The color is beautiful, and so is the versatility. Pair this with pasta primavera, grilled vegetables, or as I did, a generous piece of veal, simply prepared in a schnitzel style with an herbed vegetable mélange. This is a dry wine with a faint sweetness on the nose reminiscent of strawberries smeared onto rainy mineral stones. The setting in which I experienced this wine made this wine that much more of an experience – the charming Merricks General Store in the Mornington Peninsula, in Victoria, Australia. This historic outpost, once an actual general store back in the 1920s, now boasts an impressive city-grade menu, in multiple versions. Its Cellar Room menu boasts interesting charcuterie items such as Barossa chicken liver parfait, ocean trout rillettes, and herbed labna balls (a nod to the Middle Eastern cheese-style yogurt spread), as well as cozy vittles like hearty soups and crusty breads. Its Dining Room menu features thoughtful starters like crème frâiche and gorgonzola pannacotta with prosciutto and honey cardamon roasted figs, and entrées such as beetroot gnocchi with mushrooms, walnuts, gorgonzola cheese and fried sage; and saffron and leek risotto with swimmer crab meat and cured ocean trout. (Breakfast/brunch is also available). Clearly, this former supply outpost has evolved with a playful sophistication that’s a surprising treat for its rustic roots. Merricks General Store (apparently no apostrophe) is also the showcase restaurant for three collections of wine: those of Elgee Park, Mornington Peninsula’s oldest winery; Quealy, featuring winemaker Kathleen Quealy in conjunction with Balnarring Vineyard, and including some interesting blends, like the white Pobblebonk Italian blend, and Rageous, an unusual red blend of Shiraz, Pinot Noir and Merlot; and of course, Baillieu Vineyards, featuring our esteemed rosé and others, all featuring those pretty labels by artist Julie Johnston. Wine, art, and the delicious pastime of hanging out at a charming foodie general store. No complaints. Does anyone have an unusual gem of a rosé to share with us? 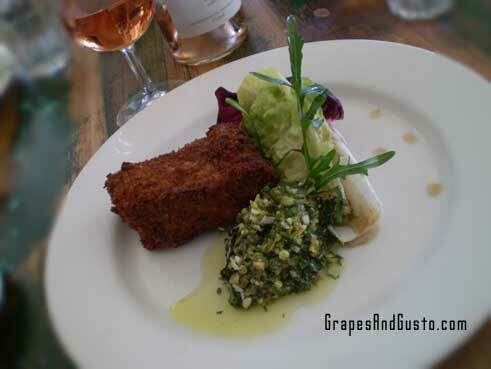 Proof of rosé's versatility: from pasta to vegetables to schnitzelled veal in a single bound.